This tip by Valery Silaev discusses TimedTrigger on WebDynpro and how to create a mechanism that reduces delay from the initial value for any server-side action invocation. Today's post falls into second category, so it is just yet another (and hopefully useful) application of calculated attributes. It is common for quiz-like applications to limit time user can think over the question. Not a big deal, you might say, just place TimedTrigger on WebDynpro view, set delay property to the necessary value and you are done. It's not that simple! 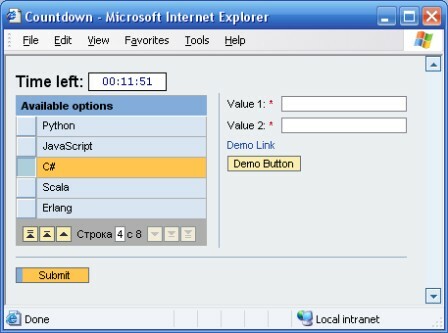 See, WebDynpro server-side rendering causes client-server requests when either user invokes certain action (button or link click) or WebDynpro internally "decides" that it is necessary to query server, for example, to fetch the next page of rows when user scrolling Table UI control. Hmmm... And what is the problem? Well, the rendering engine for WebDynpro HTML client (probably others clients as well) sends a complete page back. Re-read this: there is no "delta" updates currently, and the whole page is sent back. So WebDynpro renders all controls and sends HTML back to client. The new content replaces the old stuff in a "flicker-free" manner and the user doesn't even notice the full page replacement in most cases. Still do not understand the point? Then it's time for an "Aha!" moment. What value do you think TimedTrigger.delay property has after such a round-trip? Yes, the one defined on server-side, i.e. the initial one. This is a problem. Say, you defined that question must be answered within 5 minutes, and set delay of TimedTrigger to 5 * 60 = 300. A user sees the question and thinks a bit. 40 seconds passed, 260 seconds are remaining. Next she tries to select row in table, the client-server roundtrip is performed and she has yet another 300 seconds at her disposal. 40 + 300 = 340. Another action, another 300 seconds added to available time. It's not a fair game! First, we need to save timestamp on server when question is initially shown to user. The best place is either wdDoInit of view controller or handler of inbound plug. As far as we do not plan to show this value on UI, we use internal controller variable startTime (long) rather then context attribute. Next, we have to bind the TimedTrigger.delay property to context attribute Delay of type integer. We must use binding because we plan to alter value. And, once again, never ever use wdDoModifyView for these purposes -- bindable properties of UI controls must only be updated via context! ...where startTime is a timestamp saved in , and element.getTimeout() is a configurable value for total time user may spend on question. Java returns the timestamp in milliseconds, and TimedTrigger uses second as lowest resolution, so we have to adjust time spent on question (startTime - System.currentTimeMillis) correspondingly. Note, that this will be negative value that is later taken from total time (element.getTimeout()). It's probably not obvious why it is necessary to use Math.max(1, calculatedTimeLeft). First of all, negative values for TimedTrigger.delay cause an error. Second, zero value disables TimedTrigger at all! But the real reason is here. 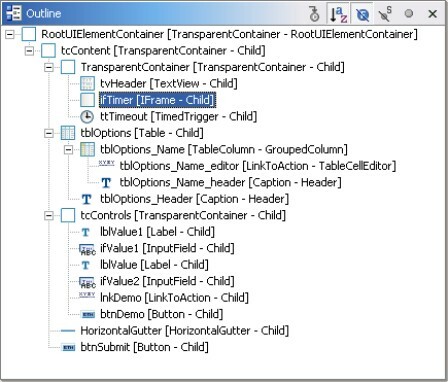 At the time the Delay attribute getter is invoked, we know that WebDynpro renders a client response. And we may not interrupt this process in any way. 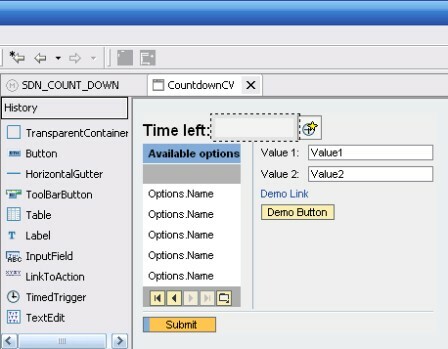 So even if time is over according to calculations, we must allow WebDynpro to sent response back to client. But with minimal allowed delay value: one. So TimedTrigger will fire almost immediately and application forwards user to another page (with explanation that she was unable to answer question in time). So far so good. But application still misses yet another feature common for time-limited quiz applications, namely visual timer that instantly informs user about time left. Unfortunately, WebDynpro currently have no such control. And emulating it with yet another TimedTrigger is impossible in this case, read the documentation for TimedTrigger control to understand better why. You can find more details about this technique in my earlier post. It must be noted that the solution is not perfect. The actual time spent on a question may exceed the defined one in one-two seconds. Remember this math -- 1, calculatedTimeLeft -- thing? But I guess it's not so critical for quizzes. As usual, you may download source code ("Save as...", rename to *.zip). The application is created using NW04s, but it should be easy to back-port it to NW04.